today is international stand up to bullying day. students and lots of other people all across canada and the world wear pink to mark the day. last year, two students in nova scotia (canada’s east coast) donned and distributed pink shirts after a classmate fell victim to homophobic bullying for wearing pink to school. this became the driving force for teachers across the country to renew a call to end bullying. the term “bullying” is most often used at school but let’s not forget that it can apply in other situations as well – at work, in the boardroom, at sports activities, in volunteer situations, here on the internet, in hospitals, etc. have you ever been bullied? have have you ever stood up to a bully? This entry was posted in emotional health, news and events, peace, environment, social justice et al, queer talk, gender issues and sexual identity and tagged activism, bullies, violence on February 27, 2008 by isabella mori. There is bullying and bullying. Taking basic measures against bullying is ok. As long it does not go too far, such as when the Colorado schools have banned tag on its playgrounds … because some children complained that they were chased. Frederic from the Vancouver Blog’s last blog post..NO SECOND TRIAL FOR PICKTON. 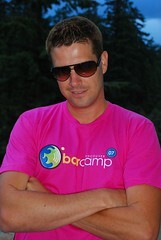 I thought about digging out the Barcamp shirt today for that very reason, but I couldn’t find it in my t-shirt stack, and I’m taping a Lab with Leo segment today (sans pink t-shirt). Thank you for helping my support the cause, albeit in an indirect way. Am I still supporting the cause if I switch my Facebook photo to this one? Does that count? Thanks for the reminder – I’ll dress accordingly, today! Nancy’s last blog post..Tuesdays Econ 101: when did we get such a hate-on for taxes? I haven’t been bullied (by peers) much since the early years of schooling. In some ways bullying seems to be the way that a lot of worksites operate (implicit threats, no consultation or care). Consider the attitude that schools have to be unpleasant so students are prepared for ‘the real world’ (ie. a world of bullies). hey, @frederic, long time no see! i agree, we can go too far … but then if we have teachers and principals who dare to stand up for common sense, that shouldn’t be a problem. @evan “schools have to be unpleasant so students are prepared for the real world”? yuk! that’s like saying, hey let me beat you up so that you’re prepared for the next mugging. yup wore pink (somewhat disastrously though – not a great work shirt). anyway, I think it’s great for us adults to wear pink, but I hope lots and lots and lots of kids themselves wore pink — that’s the spirit of this, I think, kids standing up for themselves, empowering themselves. Any news on the kid front? i was at my daughter’s elementary school today. she was pretty excited about wearing pink and said that about 1/4 of the kids at her school were wearing pink. most of the teachers were in pink, too. i am very grateful that i can feel so confident that at least at her school, things like that are taken very seriously. what a gift. @chris, that’s a wealth of information about bullying on your blog there. one of the first articles is about dealing with a bully teacher – i think it’s really important to remember that authority figures can be big bullies, and we need to know how not to get intimidated by them. thanks for the info, blaxter, that’s very interesting. i like the idea of thinking about bullying in terms of the metaphor of running into an actual bull. Well, it’s the educational system which has to be blamed. Students need to be taught proper discipline in the school. I was lucky never to be bullied in school. But it really gets into your mind when you are being bullied. We have heard of so many young children commit suicide and all that. This has to stop at all cost. I did blog about my bullying experiences here. There was one boy in my year at school who got pretty much all of the bullying. I don’t know why. Perhaps he gave off a pheromone that sent bullies wild. But the rest of us were left alone because he was the number one target. I don’t know why people bully. I blame the parents. It takes some courage to wear a pink shirt especially if you were bullied one day. .-= Weber´s last blog ..VuokramÃ¶kki Ahvenanmaa =-. At my highschool back in the day we used to have a fundraiser for bullying awareness, they sold mainly pink t-shirts with the words speak up and some design on it. Thought it was really cool.